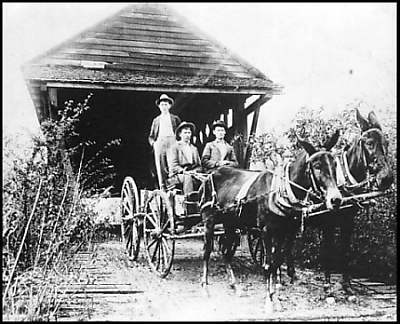 This covered bridge over the Yocona River, photographed in the early 1900s, was one of several covered bridges in Lafayette County. Old maps depict the slow, muddy river as the "Yockney-patafa" River, from which Faulkner derived the name of his fictional county. A mule-drawn team such as the one depicted brings to mind the ill-fated crossing of the flooded Yoknapatawpha River in Faulkner's novel As I Lay Dying. This page has been accessed 4740 times. About this page counter.